It is the time of year for best-of and top-ten lists, so I thought I’d add my own version and discuss, in the next few posts, some of the books I’ve read over the past year. I’ll begin with What Happened to Sophie Wilder, the 2012 debut novel of Christopher Beha. The story concerns Charlie Blakeman, the narrator, an unsuccessful twenty-something writer living in New York and the title character, Charlie's ex-girlfriend and heralded author who has disappeared from the public eye after her recent conversion to Catholicism. The story begins as Sophie, recently separated from her husband, reenters Charlie’s life after five years. The narration jumps between past and present and Charlie pieces together, one layer at a time, her story. We too, encounter characters and situations in gradual unfoldings. Another central character emerges—Bill Crane, Sophie’s father-in-law, suffering from cancer—whose attitude towards God is antagonistic, to say the least, and provides a true test of Sophie’s newfound faith as she cares for him, despite her separation from her husband. The novel is as tightly woven as any I’ve read in recent memory, and it left me spellbound. Beha is a writer’s writer who does not commit the sin of trying too hard to impress. I won’t give away the ending, but it achieves the dual feat of unraveling organically from the story and at the same time leaving much unresolved. This book drew me particularly because it concerns the two worlds, often seen as radically antithetical, that have shaped my thinking over the years. One world is that of Charlie's and Sophie's friends, over-educated New York hipsters; the other is that of the Catholic faith. Beha, thankfully, does not romanticize either. The graduate-school-cultural-critic crowd comes off as frivolous, comic at times, and ultimately destructive. I recognized it instantly. For all it did to stimulate my intellect, the world of heavy literary theory and navel-gazing creative writers ultimately lacked something transcendent, something rooted in a reality outside of the self that could continue to nourish after the thrill of being part of an artsy, edgy crowd wore off. For anyone who has spent time around this crowd, usually found in proximity to humanities departments at universities, it goes without saying that it is anathema to admit religious devotion. And it’s not so much particular beliefs or specific doctrines that they disdain—it’s the believing itself, in something which appears, to them, to be nothing more than a fairy tale. Thankfully, though, unlike so many in this literary scene today, Beha treats faith seriously. The story of Sophie’s conversion is not one of apparitions and light but of a gradual turning that stems from her reading of Augustine and Thomas Merton. Sophie distances herself from her college friends as she grows more religious, but, as Beha would have it, that’s a sign of her progression, not regression. Beha is a deputy editor at Harper’s, and from what I’ve read of his essays and interviews, like many thinkers steeped in the tradition of the great books, he has a healthy distrust of materialism. That suspicion shows in this novel. Sophie and Charlie, both writers, are driven by a need to explain their lives through stories, to close the gaps in their understanding with narrative arcs, and it’s not a stretch to say that the book’s central concern is our deeply human need for stories. The novel is not pious, by any means, but because of his characters’ commitment to storytelling, the door to faith is always open. Because the novel treats narrative as fundamentally human, faith is an important option for his characters. As I mentioned Beha purposefully includes some significant gaps—concerning the characters’ pasts as well as the story’s denouement—but ultimately these empty spaces are gnawed at by his characters’ well established need to fill them. The narrative gaps do not, as in much post-modern literature, exist as if to say, “Who knows anything anyway?” Here, in Beha’s novel, what is left unresolved draws our attention, as if by relief, to the human need for resolution. Most of these unresolved moments in the novel concern the tremendous suffering of its characters, and these characters—especially Sophie, Charlie, and Bill—define themselves by their narrative responses to their suffering. How do they make sense of unspeakable pain, tremendous grief? It’s really the age-old question of theodicy: how do we account for evil in the world? The novel’s response neither sides with theism or atheism, but rather focuses on the need for response itself. Beha’s book seems to say that stories are all that we have on this earth, and thus we have a deep obligation to their crafting and upkeep while we are here. The esteemed British critic Frank Kermode, writing in A Sense of an Ending, claims that “it is not that we are connoisseurs of chaos, but that we are surrounded by it, and equipped for co-existence with it only by our fictive powers.” Fr. Andrew Greely, in The Catholic Imagination, writes that “Religion is story before it is anything else and after it is everything else.” Either of these quotes could serve as an epigraph for What Happened to Sophie Wilder. One might describe Beha’s book as a cross of sorts between The Life of Pi and Oedipus Rex. It’s as well written of a treatment of the human need for faith (and therefore, story) as anything I have read. Beha has published a second novel, called Arts and Entertainments, that satirizes modern celebrity, in the vein of Evelyn Waugh’s biting comedy. I hope to read it soon. Thanks Steve. They are both really good, in their own ways. I also got around to reading Beha's "Arts and Entertainments," which turned out to be laugh-out-loud funny. 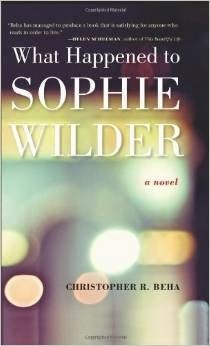 "Sophie Wilder," I thought, was all-around a better book, though.